High Quality Sounds. Real Time Control. , Every guitarist craves a better way to satisfy his hunger for ultimate tone and control. The new AX3000G satiates that need with a powerful multi-effect processor that reaches far beyond its predecessors. 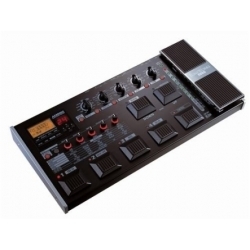 Featuring Korg's proprietary "REMS" modeling technology, the AX3000G delivers high-quality modeling sounds and numerous ways to control those sounds in real time. With an expression pedal, a control switch, and an expression step sequencer, the AX3000G Modeling Signal Processor has all the elements a guitarist needs to fulfill his expressive vision.